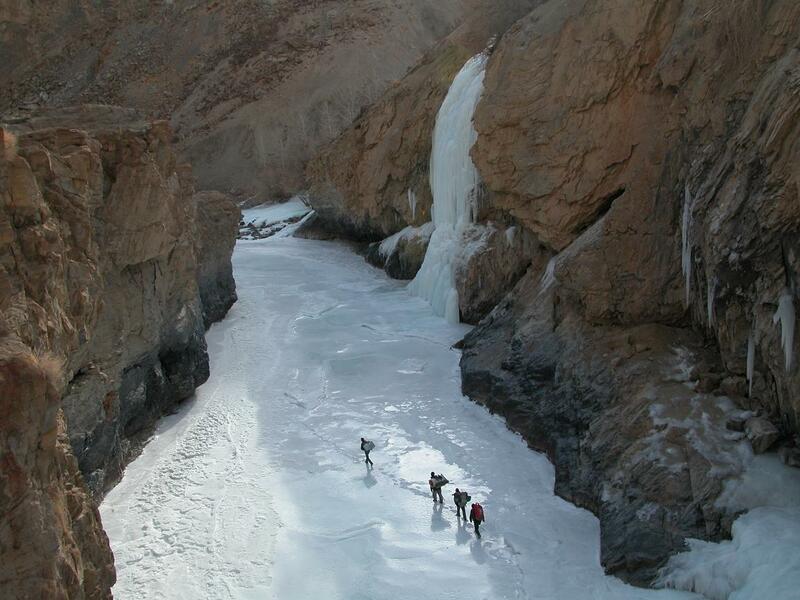 Walking on Frozen river of Zanskar is an ultimate experience for adventure lover. The traditional name of the trek is “Chadar trek” the frozen sheet, which was only way in and out for Zanskaris in winter when all other ways are closed due to heavy snow fall at high passes. Therefore, it had been trade route for centuries for Zanskari People. 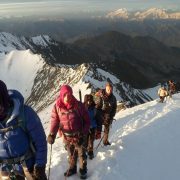 Now the route is also famous as winter trekking among adventure lovers. For last several years, we have been organizing this winter trek in three different options with trained local Zanskari potters and our well-experienced guide and staff. The coldest temperatures may shudder your bodies in the mornings when the temperatures are often at their lowest. You’ll be up at 8AM and we start walking around 9:30AM. By then the days are typically sunny with blue sky although cold and truly fresh! Of course, by now you’ll be spellbound by your surroundings all over again and so easily will forget the discomforts of cold. 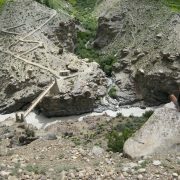 This is a trek into some of the most isolated yet inhabited regions in the Zanskar mountains, most notably the village of Lingshed. 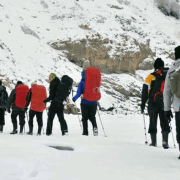 Trekking on ice, the frozen Zanskar River, we average five to seven hours daily at an easy pace but a reasonable degree of physical fitness is needed to sustain walking for nine days during winter conditions. 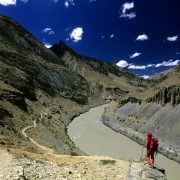 The trek commences from the village of Chiling located not far from the confluence of Indus and the Zanskar River. The trek follows the river gorge through a spectacular landscape, a photographer’s paradise, offering occasional sighting of wildlife. Although pleasant on clear, sunny days, the weather conditions can change abruptly, with wind temperatures known to plummet minus 20 to 30 degrees Celsius. Chiling and Lingshed are the only sizeable villages on this trek, all the rest are names of places and caves along the route. Early morning flight Delhi to Leh, transfer to hotel and rest. Morning sightseeing – Shanti Stupa, and Sangkar Gompa; lunch at hotel, afternoon rest. Sightseeing around Sham, the lower part of Ladakh, visiting Likir and Alchi monasteries. Leh to Chiling (by private bus or jeeps) along with our porters from Zanskar, 5 hours; visit coppersmithing workshops. 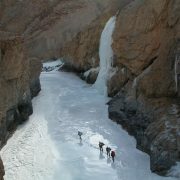 Walk on ice of the frozen Zanskar river, Chadar, commences from Chiling, stage one to Zaribago, 5 hours. Zaribago to Deepyokma 4 hours. Deepyokma to Nyrakpulu 4 to 5 hours; camp below Nyarak village, ten minutes up along a small stream. Nyarakpulu to Lingshed, one hour walk on Chadar, then 5 hours steeply up to Lingshed village; stay in private house, relax in a heated room. Full day rest in Lingshed, one of the most remote villages in Ladakh, visit monastery, school for monks, roam around the village. Ligshed to Nyarakpulu, 5 hours. Nyarakpulu to Tsomopaldar, 4 hours. Tsomopaldar to Tilatdo, 5 hours. Tilatdo to Chiling, and return by jeep to Leh, 5 hours. Full day of rest in Leh. Return flight to Delhi; depart from India. Taking part in the above tours to Ladakh that will take you into altitudes above 4,500 meters/14,000 feet, you should be familiar with the prevention, recognition, and treatment of altitude illness including shortness of breath, restlessness, sleeplessness and headaches as well as other health dangers potentially arising from trekking at high altitude. Please do note that for some treks we will require proof of your medical fitness, a thorough physical exam and certification from your doctor that you have no general medical problems that could result in any potentially serious medical consequences while on a trek. Trekking at high altitudes is strenuous and you must be in top physical shape in order to endure up to eight hours of trekking over steep, often rocky terrain as well as snow. To be able to sustain and hopefully enjoy such a demanding exercise, you need to possess good cardiovascular endurance and muscular strength. In order to prepare yourself for your trekking tour you should undertake regular aerobic exercise or training that includes jogging, cycling or swimming, exercising 3 -5 times per week for at least six months prior to your trip.